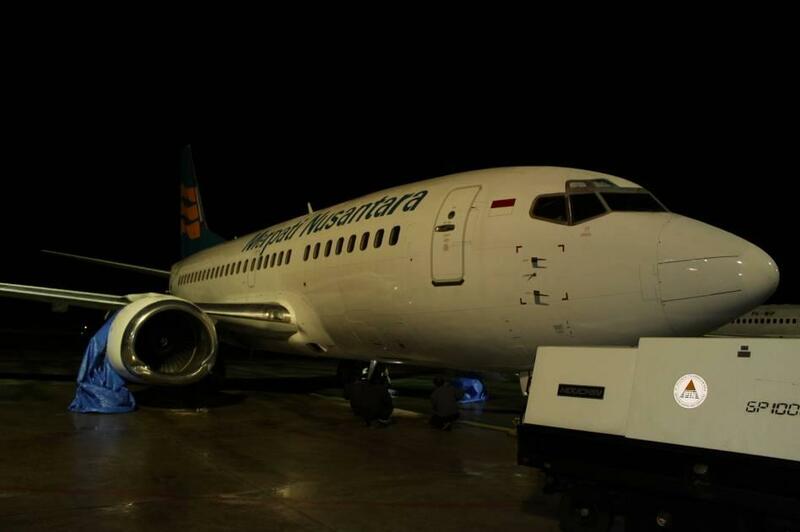 On 26 Dec 2011, Boeing 737-500, PK-MDT, 26704/2508, operated by Merpati Nusantara Airline was performing an ILS approach to Makassar (WAAA) runway 13 in thunderstorms. The F/O was PF under line training, he had 188 hours 15 minute total flying time on type. At approximately 550 feet RA, the PF felt uncomfortable with the rain conditions and suggested to go around. The PIC advised that the runway was in sight and suggested to continue the approach and took over control of the flight from the F/O. At approximately 20ft RA the F/O advised the PIC to fly left. After touchdown the aircraft veered to the right side of the runway, hit the taxi sign board and rolled on the shoulder for about 375 meters then returned to the runway. The pilot continued taxi and park where the passengers disembarked normally. 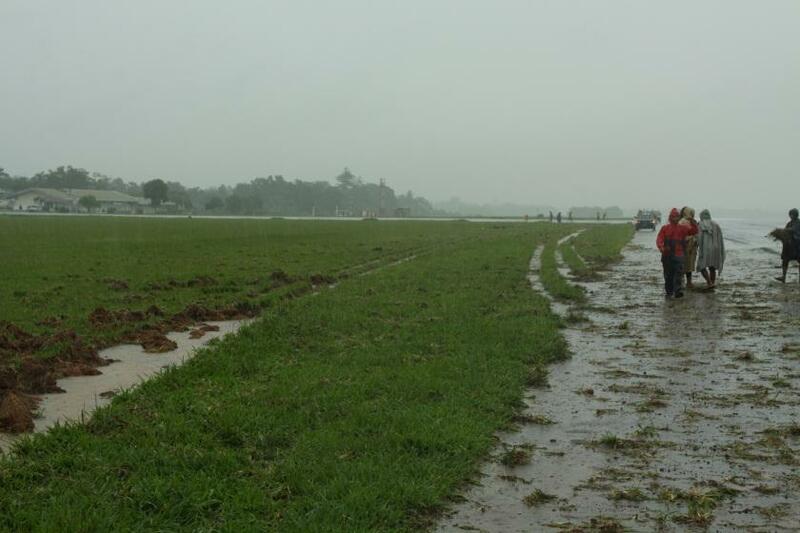 The runway 13/31 surface was asphalt and a length of 2,500m and width of 45m. At touchdown the left thrust reverser deployed a second before the right thrust reverser. Three seconds later Eng #2 N1 indicated a greater value than that of Eng #1. The maximum differential value recorded was up to 35% for 16 seconds later. Braking application after touchdown indicated asymmetric application and 200psi more left brake pressure than right brake pressure for 12 seconds. The last recorded wind check was 290/7 given at 10:34:54, approximately 3 1/2 minutes before touchdown. 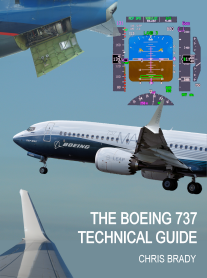 The FCTM on Reverse Thrust Operation, described that after touchdown, rapidly select the thrust reversers. The PM should monitor the engine parameters and their limitations and inform the PF of any deviations. 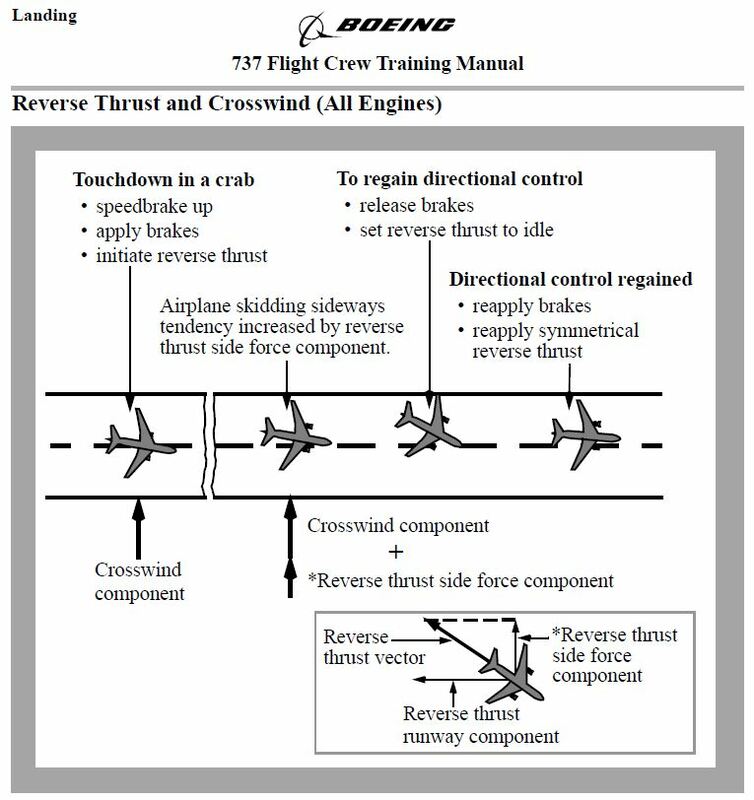 The FDR data recorded that at touchdown the left thrust reverser deployed a second before the right thrust reverser, momentarily resulting in asymmetric reverse thrust. Three seconds later the N1 of the right engine was greater than that of the left engine, with a momentary differential value recorded up to 35%. The increasing of the N1 after the thrust reverser deployed would increase the drag and asymmetric reverse thrust would also create asymmetric drag. The N1 of the right engine was greater than the left engine which mean that the drag induced by the right engine was greater than the left engine. This condition led to the aircraft veered to the right. During the landing roll, the CVR did not record any communication from the PM to the PF about the engines parameters. The SIC might not have fully adapted to the role of PM following the handover of control to the PIC. This led to the continued asymmetry of the reverse thrust, and worsening the situation. Moreover, the FDR also showed asymmetric brake pressure application 12 seconds after touchdown, in which the average left brake pressure was 200 psi greater. The FCTM stated that the reverse thrust side force component drifts the airplane to the downwind side of the runway and high braking forces reduce the capability of the tires to corner in order to regain the aircraft direction. The brake and reverse thrust applications were not in accordance with the FCTM procedure for regaining the directional control and consequently led to the aircraft diverging from the runway during the landing roll. The inadvertent application of asymmetric thrust on landing led to the aircraft to veer to the right. The PM did not advise the PF of the differential N1 during reverse thrust application. The brake and reverse thrust applications were not in accordance with the FCTM procedure for regaining the directional control and consequently led to the aircraft diverging from the runway during the landing roll..
NB the report states that "The PIC had accumulated 1,339 hours and 27 minute total flying time and total time on type of 440 hours including 134 hours 38 minutes in the last 90 days." This total time must be an error as the PIC was training the F/O and had been in the company for 22 years. The fiull report is available here.